Alpha Video & Audio, Inc. and FunWall Inc. announced a unique partnership to bring FunWall’s proprietary mobile social gaming platform to social infrastructure owners across the United States. FunWall’s unique technology instantly gives infrastructure owners a powerful new communication and incentivization platform, transforming traditional one-way communication channels such as digital screens into intelligent, two-way consumer experiences. The ability to harness the ubiquity of mobile games provides social infrastructure owners (malls, stadiums, arenas, retailers, bars, restaurants, casinos and QSR’s) with a radically new and powerful tool to influence consumer’s short-term behavior and to build valuable long-term relationships. Social mobile games provide the perfect vehicle to engage, entertain, capture, and incentivize an audience. The FunWall platform also provides a new link between cloud and place based gaming. Using the power of “place” to fill the cloud – then using the power of the “cloud” to populate the place. Alpha Video offers enterprise-class solutions and services for every facet of an audiovisual integration project. From design engineering and project management, to hardware installation and support, Alpha Video has over 45 years of experience in combining video and audio technologies to create customized broadcast, presentation, collaboration, digital signage, and IPTV solutions. Being a member of Professional Services Network International (PSNI) enhances Alpha Video’s ability to integrate projects locally, nationally, and worldwide. PSNI is an elite alliance of technology integrators, manufacturers, and distributors that work together to extend and multiply resources to help their clients take full advantage of the latest visual communication technology. Alpha Video and FunWall will offer a fully integrated social gaming experience to infrastructure owners of every type, allowing them to seamlessly unlock this previously untapped communication channel. FunWall and Alpha Video will deploy its new proprietary “GeoGame” platform, which allows large infrastructure owners to predetermine specific gaming zones on their properties. This unique tool unlocks the ability to “nudge” consumers to specific locations at preset times, creating a unique way to physically attract an interested audience on demand. “Even after 45 years, Alpha Video approaches every new project with a sense of passion and a spirit of innovation. That’s why we’re excited to partner with FunWall to introduce a new way for people of all ages to engage with some very cool visual technology” said Lance Hutchinson, Vice President of Alpha Video & Audio, Inc.
FunWall’s unique platform takes the buzz around eSports and places it at the fingertips of consumers whenever and wherever they are. FunWall is the first technology allowing consumers to take any mobile game from a “one-on-one” challenge to a “play-the-entire-world” tournament. “FunWall makes the vital audience connection by combining fun and incentives into the same experience. 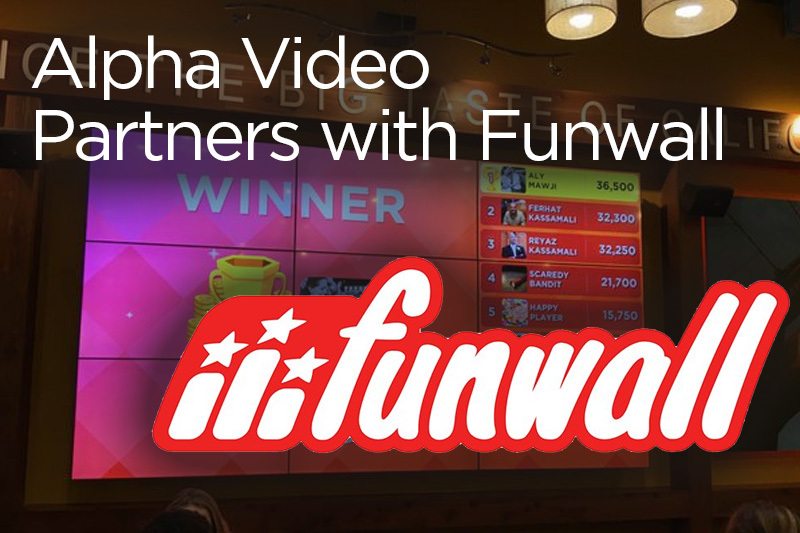 Alpha Video is the perfect trusted partner to help bring this experience to infrastructure owners everywhere” said Steve Ridley, CEO of FunWall.